Our site has the clearest skies for seeing and cloudless nights in Australia. We are the only telescope hosting facility to record and publish our "nightly" statistics (not annual statistics), because we know we are equal, if not the best site in Australia. So what is a clear night in our terms? A Clear Night is defined by us as six hours of continuous clear dark skies at the minimum. We are very excited about our future in the telescope hosting industry and intend to be leaders in the field, setting a world class standard in telescope hosting facilities and customer service. As of June 2011, we have also introduced an additional criteria "Mostly Clear" to show the nights where imaging is fine, but the sky has not stayed continuously clear for the strict six+ hours minimum. A Mostly Clear Night is defined as four to five hours of clear dark skies with the night broken by some cloud. We introduced this extra definition as we observed that we have recorded and utilised many nights with four to five hours of clear, usable imaging time. Previously, our history of statistics only distinguished between cloudy or clear following the six hour plus criteria, which left many nights listed as 'cloudy' that actually had good regular quality imaging time. Now you can see that we can offer you a large window of opportunities to view through our clear skies with regular clear or mostly clear nights. So yes, we definitely feel confident our skies at Riverland Dingo Observatory Telescope Farm are the clearest in Australia and have the statistics to show it. In general, the south of Australia has continued waves of cold fronts year round, whereas northern Australia has the relatively stable tropical weather patterns year round. Our site is located between the southern and northern Australian weather patterns placing us in an even better position of relative stability. To our advantage, we selected to position the site in an arid desert climate which in general means days are hot with the nights being very cold. The exception to this is in the middle of summer where temperate at night can hover around 28C / 80F due to extended heat waves. The annual rainfall here at Moorook is approximately 264 mm and cloudy days are limited. Sight normally ranges from 1.5" to 2.8" FWHM with best being around 1" FWHM and the maximum being around 4.5 FWHM. To back up our statement, you can also do your own research by looking at our nightly cloud graph and the all-sky cam and compare your observations with our nightly records. The ring-shaped mag. 10.8 planetary nebula, NGC2438 (Herschel H IV.39) is a 1.3' dia. 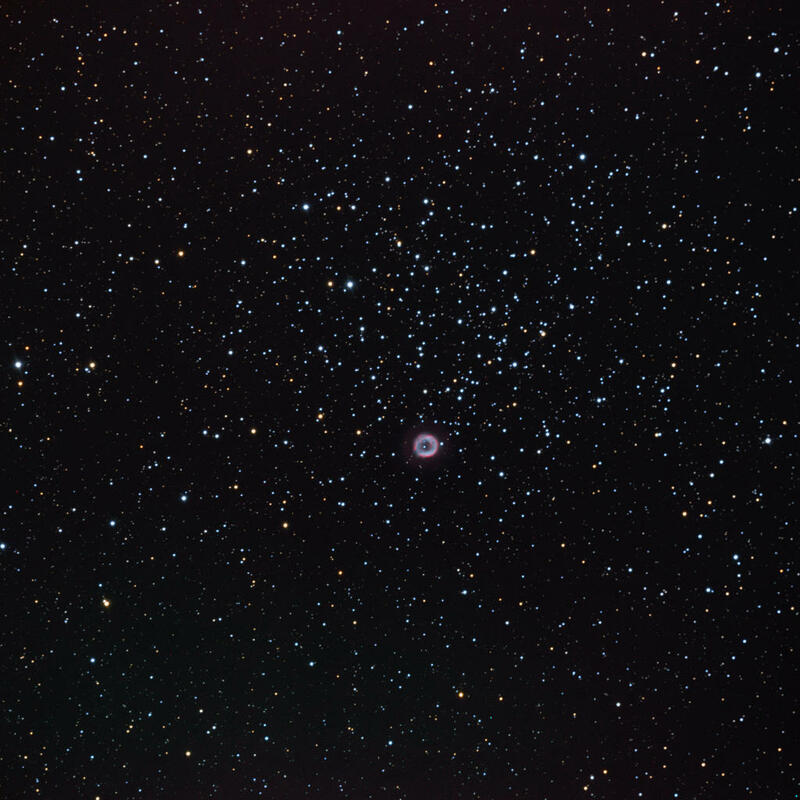 planetary nebula in the constellaiton Puppis that appears within the larger 20', mag 6.1 open cluster, NGC 2437 (M46). NGC2438 is superimpsed on M46 but is not a member of the open cluster. It is 2,900 light years distant and was discovered by Herschel in 1786, whereas M46 is thought to be 300 million years old and is 5,000 light years distant. The bright star near the center of the nebula is not the proginator star, which is likely to be the adjacent small, bluish star that SEDS indicates is a mag 17.2 star. The planetary nebula color and detail were augmented with 1 hour of Astrodon 3 nm OIII and 1.3 hrs of 5 nm H-a. The OIII has the shape of a complete ring whereas Ha forms an horseshoe shape with the opening toward th north (lower left). There is an extended halo ~2.5' in diameter surrounding NGC 2438 that is brought out by the narrowband data. NGC 3109 is a small, irregular galaxy in Hydra that is approx. 16 x 3 arcmin in apparent dimension and 4.5 million light years distant. It was discovered by John Herschel in 1835. It may be a part of a group of dwarf galaxies, all of them Local Group member candidates, including the Antila Dwarf galaxy, but this is still contested. 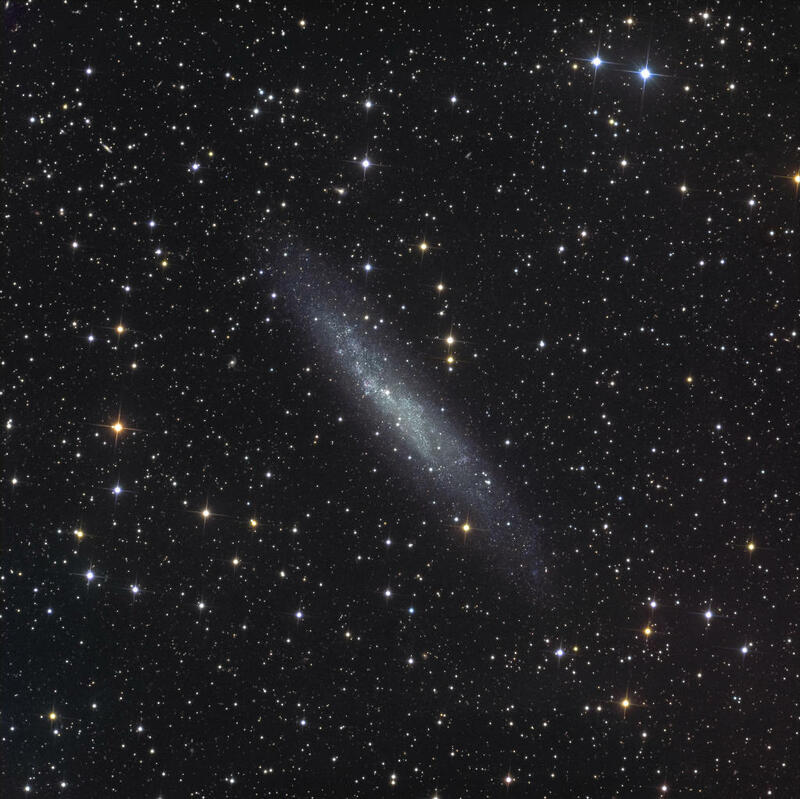 It has a spiral galaxy designation, but appears flattened without much detail. It has been the subject of considerable research. It has low surface brightness, a considerable warp in the disk and new star formation. NGC 4945 is a nearly edge-on galaxy in the southern constellation of Centaurus. 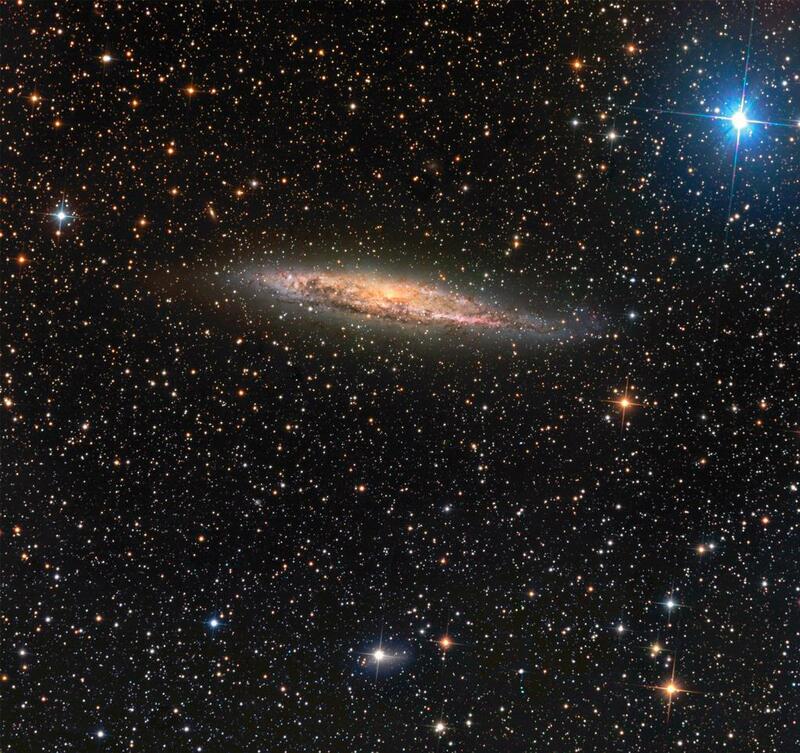 Giant complexes of gas and dust in the disk give it a patchy appearance, similar to NGC 253, The Sculptor Galaxy. The active nucleus has starburst and Seyfert II characteristics. Its yellow color is due to its dust and our view through the dust of the Milky Way. The dust in NGC 4945 absorbs much of the light from bright, blue stars, and re-readiates it at infrared wavelengths. It is a very bright galaxy in the infrared. Water emission has been detected using the Very Long Baseline Array. It is 13 million light years distant at RA 13hr 5.4m and DEC -49d 28m. The image is ~ 40'x40' and North is to the upper left. NGC 6164 is a bipolar nebula in the southern constellation of Norma. It is about 4 light years across and close to Earth at 4,200 light years. The bright central O-type star (HD 148937) is nearing the end of its life and will likely become a supernova. It is 40 times the size of our Sun. North is to the left. The bright bar at the southern end is NGC 6165, so the object is commonly referred to as NGC 6164-5 or 6164/6165.It is not a planetary nebula because the central star is an extreme O-type, mass-loss star, similar to a Wolf-Rayet star.text goes here. The narrowband filters help to bring out the extended outer OIII-rich halo that represents an earlier expulsive phase. 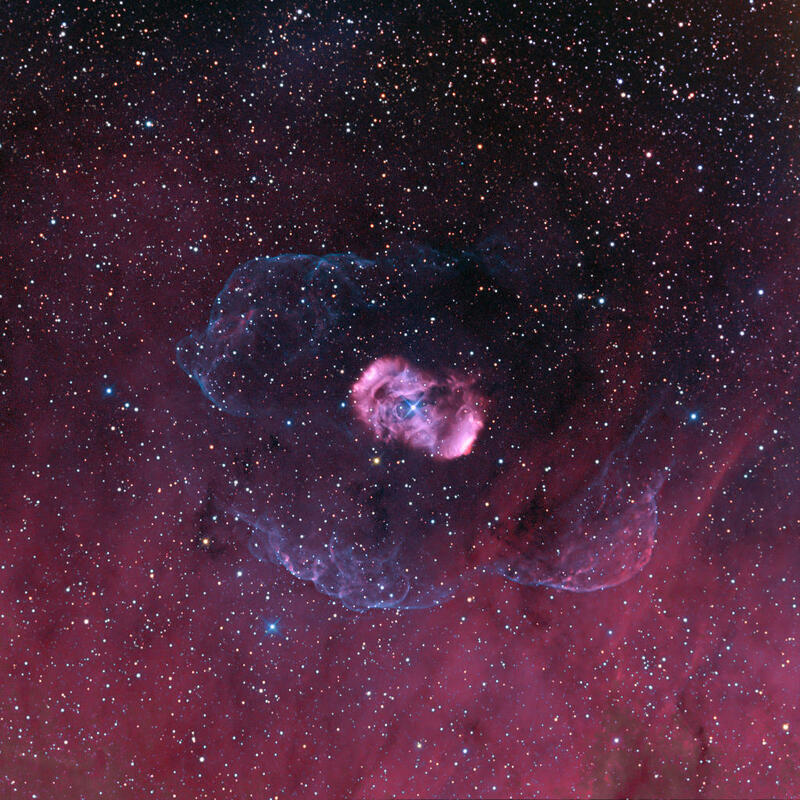 This is one of few images showing the extent of this halo, that is embedded in the surrounding nebulosity. It is not uniform likely because the interstellar medium that it is expanding into is not uniform. Such halos are present around other objects, such as planetary nebula, including the Ring Nebula (M57) or the Dumbbell Nebula (M27). The extended halo around NGC 6164 is ~21 x 13'. The main bipolar structure is ~ 6 x 2.5'. Cometary knots are suggested in north end of the bipolar region that are well-defined in the Gemini South image (see below).